Victor Blue, a brother of Rupert Blue, was born in Richmond County, North Carolina, 6 December 1865 and graduated from the United States Naval Academy in 1887. Lieutenant Blue was advanced five numbers for intelligence missions in Cuba during the Spanish-American War. He served on the Suwanee, and attracted general attention in June, 1898, by penetrating 72 miles within the Spanish lines in the vicinity of Santiago, Cuba, and definitely determining for the first time the presence of the Spanish fleet in Santiago harbor. 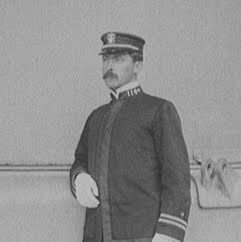 He commanded the Alvarado, a gunboat captured from the Spanish, in the attack upon Manzanillo, became Flag lieutenant in the Pacific Squadron, and served in the Philippines in 1900-01. From the ranks of inspector of ordnance, held in 1905-07, he was promoted until he became commander in 1909 and in 1910 chief of staff in the Pacific Fleet. Soon thereafter he was transferred to duty on the General Board of the Navy Department. He served as Chief of the Bureau of Navigation. Under Admiral Beatty he commanded Texas in the North Sea during her service with the 6th Battle Squadron. He was made rear-admiral on April 1, 1919.